There are some people who love the morning. They jump out of bed and are ready to face the world. There are others that refuse to acknowledge mornings exists unless they have a cup of coffee or tea. 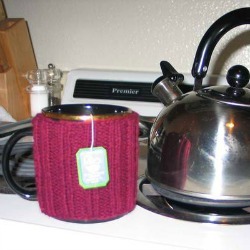 Show those caffeine fanatics that you care about their cup of fuel with a Knitted Mug Cozy. Craftster member Dani24 shares her pattern for this fun little cozy that is the perfect addition to any mug. Personalize it with embroidery, beads or other charms. Fill the cup with teas, chocolates or a gift card to their favorite coffee shop. This is the perfect gift for coworkers and teachers. Christmas is almost here! There is still time to craft a great present with inspiration from our Handmade Holiday Gift Guide.